To reach his job at the St. Paul-based International Institute of Minnesota, Urbanski rides a Route 18 bus to downtown Minneapolis and transfers to Route 3. His experience is useful: as an employment navigator for the International Institute, Urbanski helps teach new Americans how to navigate the Twin Cities using transit. One of their first lessons is how to reach the Institute's office, located near Como and Snelling avenues. Stretching between downtown Minneapolis and downtown St. Paul, route branch 3A runs largely along Como Avenue. Branch 3B charts a similar course but veers south at Snelling Avenue, continuing to Rice Street on Energy Park Drive and Front Avenue, serving employers in St. Paul’s Midway area. The University of Minnesota, Minnesota State Fairgrounds, Como Park Zoo & Conservatory and State Capitol are among the destinations on the route. Beginning June 14, Route 3 will also connect with the METRO Green Line's Capitol/Rice Street Station, West Bank Station and light rail stations in downtown St. Paul and Minneapolis. Last year, Route 3 generated nearly 2.8 million customer boardings, making it one of the top five bus routes operated by Metro Transit. 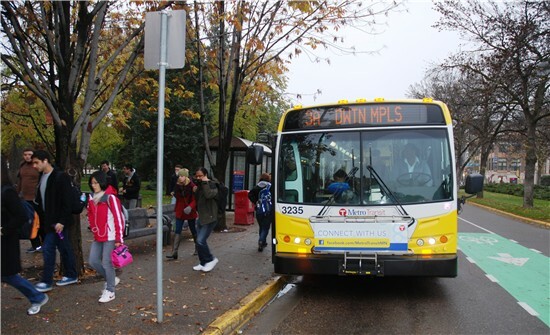 More than a third of those who rode Route 3 last year used a U-Pass, which provides University of Minnesota students unlimited rides for less than $100 a semester. Returning west from St. Paul, a recent Route 3 bus quickly filled with U of M students on their way to class. Among them was Paul Leingang, who lives in downtown St. Paul and rides the bus every day to get to the U of M’s St. Paul campus, where he is studying fisheries and wildlife. “With unlimited rides, you really can’t beat it,” Leingang said. Workers, too, have found Route 3 an unbeatable way to get to and from the office. Maja Beckstrom, a mother of three who works in downtown St. Paul, has been riding Route 3 since 2006. A reporter for the Pioneer Press, Beckstrom says there’s “no reason for her not to take the bus to work" when the newspaper offers cars that can be used during the day for assignments. Beckstrom uses her time on the bus to read or catch up on chores and said she sees her 30-minute commute as a nice “buffer” between the clamor of work and home. Route 3 was created in 2001 through a consolidation of routes, but Como Avenue has a long transit history. A Minneapolis streetcar line that ran from Lake Harriet to downtown Minneapolis was extended east on Como Avenue to downtown St. Paul in 1898, forming the Como-Harriet line. Service continued all day and, while many residents rode simply to enjoy the view, it was also a popular commuter route with up to 50 streetcars carrying more than 6,000 people during rush hours. Buses replaced streetcars on the St. Paul section of the line in 1953 and in Minneapolis in 1954. An original streetcar from the Como-Harriet line still runs between Lake Harriet and Lake Calhoun, in Minneapolis. At Como Park, a streetcar station is home to interpretive museum about the Twin Cities Streetcar Line. An adjacent streetcar bridge, built in 1904, was placed on the National Register of Historic Places in 1989. 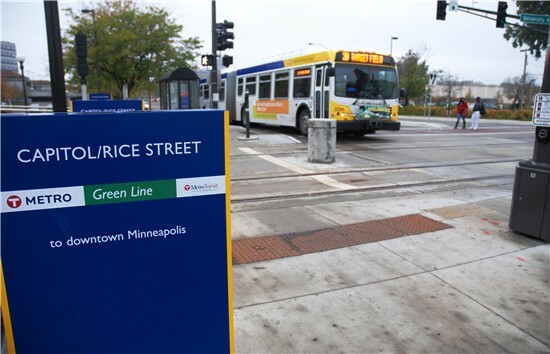 No significant changes to the route are expected in the future, but westbound buses will be moved from Wabasha Street to Minnesota Street when the METRO Green Line opens next year. Route 3 will also make timed transfers to the Green Line at the Capitol/Rice and West Bank Stations. Service: Route 3 buses run between the Ramp B/5th Street Transit Center in downtown Minneapolis and downtown St. Paul, largely along Como Avenue. Route 3A runs on Como and Maryland avenues to Rice Street while Route 3B veers south at Snelling Avenue to Energy Park Drive and Front Avenue, serving businesses in St. Paul’s Midway area. Other destinations along the Route 3 corridor include the University of Minnesota's main and St. Paul campuses, the Minnesota State Fairgrounds and Como Park Zoo & Conservatory. Route 3 buses stop at one Park & Ride, located at Como Avenue and Eustis Street. Buses run from approximately 4:30 a.m. until approximately 2 a.m., with service every five to 15 minutes during peak periods. An end-to-end trip takes approximately one hour. Ridership: Nearly 2.8 million customer boardings in 2012, with an average of more than 7,620 passengers per day. History: Como Avenue was home to one of three interurban streetcar routes operated by Twin City Rapid Transit Co. in the 1940s and 1950s. Streetcars ran between Lake Harriet and downtown Minneapolis until the line was extended east on Como Avenue to downtown St. Paul in 1898. The Como-Harriet line operated all day. Many residents rode simply to enjoy the view but it was also a popular commuter route, with up to 50 cars carrying more than 6,000 people during rush hours. Buses replaced streetcars on the St. Paul section of the line in 1953 and in Minneapolis in 1954. An original TCRT streetcar continues to run on a section of the Como-Harriet line between Lake Calhoun and Lake Harriet. The Minnesota Streetcar Museum operates the line between May and November. The streetcar right-of-way in Como Park is now a bike trail but a Como Park streetcar station at the park has been restored. 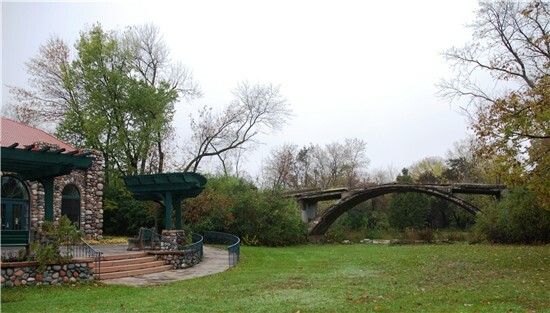 A streetcar bridge next to the museum is scheduled to be restored in early 2014. Route 3 was launched in 2002. Parts of Route 3 differ from the original streetcar line, but it follows the exact same path from Dinkytown to Como Park. Future: When the METRO Green Line opens June 14, Route 3 customers will be able to transfer to Green Line trains at the West Bank Station, Capitol/Rice Street Station and stations in downtown St. Paul and Minneapolis. Route 3's frequency and span of service will not change significantly, but westbound buses will move from Wabasha Street to Minnesota Street, where customer waiting areas will be improved in mid-2014. More details here.